Light Green Tone SuperLEAF 1-Gallon SuperPak! The real color for early springtime tree and plant foliage. Has been used by experts for softwood trees such as Birch, Aspen and Linden/Basswoods. May also be used for leafy vegetable plants and early springtime ground coverings. The light tones of Spring. Great for softwood trees like aspen, birch and poplar. 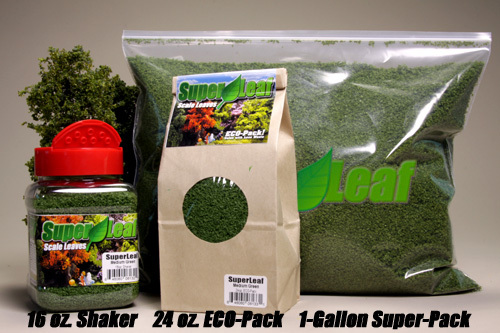 For those layouts in need of lots of premier leafy trees - available in 1-gallon super-size bag!